With so many excellent names to choose from, you might figure that the one-word-bird who first captured my imagination owned one of the more impressive ones. Lammergeier, perhaps, or Hamerkop. Bokmakierie has a particularly lovely ring, as do Bateleur and Pyrrhuloxia. But strangely enough, the bird that started it all – and still the first one-word-bird I think of – is the humbly-monikered Dunlin. 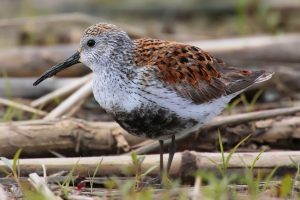 If you’re thinking that the name Dunlin doesn’t exactly get your motor running, you won’t be surprised to learn that the bird itself would seem unremarkable to most. Boring, you might even say. In fact, I’m not entirely sure why this often-drab little bird and its unassuming name have long captivated me, but I suppose matters of the heart do sometimes defy explanation. The etymology of Dunlin doesn’t help in the matter. It may share its origin with the English word dun, meaning “of a dull grayish-brown colour,” referring to the bird’s winter plumage (inspired yet?). Alternately, it may come from the Gaelic dun, meaning “hill,” and linne meaning “pool.” This, presumably, is in reference to a place where it was once observed by some long-ago Scot. In either case, this unfortunate bird has been done no favours in the name department. A typical Dunlin – a spectacular bird in a spectacular setting. But don’t disregard the plucky Dunlin, for there is much to love about this little bird. It is also a good bird to know if you happen to live in North America, Europe or Asia, because it lives and is common on those particular continents. Though it breeds in northern latitudes, the Dunlin can be seen by most during its seasonal migrations. Learn to identify this little-known wanderer, and every sweater-weather stroll with friends will become an opportunity to impress with your preponderance of nature knowledge1. The Dunlin is a shorebird, meaning – you guessed it – that it has a particular affinity for the shore, and in fact any shallow, wet environment. It is roughly the size of an American Robin, though plumper and with a longish, downward-curving2 bill. For much of the year it is clad in grayish-brown (read: dun) plumage, but in the spring and summer it sports a rather handsome rufous back and black belly-patch. Since it nests in the Arctic, though, you probably won’t get to see that. The Dunlin uses its long legs to wade about on mud flats, shallow marshes and beaches in search of its invertebrate prey. It probes its bill into the sand or muck in a fashion often compared (for some reason) to a sewing machine, gobbling up any boneless creature it comes across. It is gregarious during its travels, and may form groups of dozens, hundreds or even thousands of individuals which feed together. These impressive flocks often take to the air when startled, banking and swirling in unison before resettling on the feeding grounds. It may seem strange that this rather plain bird has earned the honour of a unique, one-word name. It is even more so because the Dunlin belongs to a group of about 20 closely-related shorebirds3 which share many similarities. Most of its kin have names like White-rumped Sandpiper, Baird’s Sandpiper, Pectoral Sandpiper, Semipalmated Sandpiper and so on. The origin and persistence of the Dunlin’s special name may be a mystery, but I believe most birdwatchers would agree that it is somehow fitting. The Dunlin in its summer plumage is almost pretty…but you probably won’t see it. While at first the Dunlin may appear strikingly similar to its cohorts, it somehow manages to be different enough that it is unmistakeable once learned. Its summer belly-patch is unique among the shorebirds, but even in its “dun” plumage its long, curved bill and chunky body instantly distinguish it from any other bird in its company. The Dunlin is so common and recognizable that in shorebird aggregations, it is often the baseline by which all other species are measured. 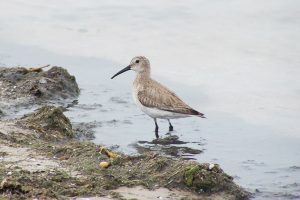 While passing a gaggle of vest-and-tilly-clad shorebirders, it is not uncommon to overhear “the bird has a shorter bill than a Dunlin,” “the bird is more slender than a Dunlin,” or other, similar comparisons. I considered starting this project with one of the more impressively-named one-word-birds, like the Jabiru or the Shikra, or perhaps even the Kakapo. But none of the other options felt right. Sure, their exotic monikers may have mass appeal, but pandering to a desire for excitement and drama ultimately felt hollow. Deep down I knew there had always been only one true choice. The bird that started it all. The Dunlin. 1 If you have the sort of friends that are impressed by such things, that is. 2 Birders would insist on calling it ‘drooping’. 3 For all you would-be bird-nerds out there, these are the sandpipers of the genus Calidris.